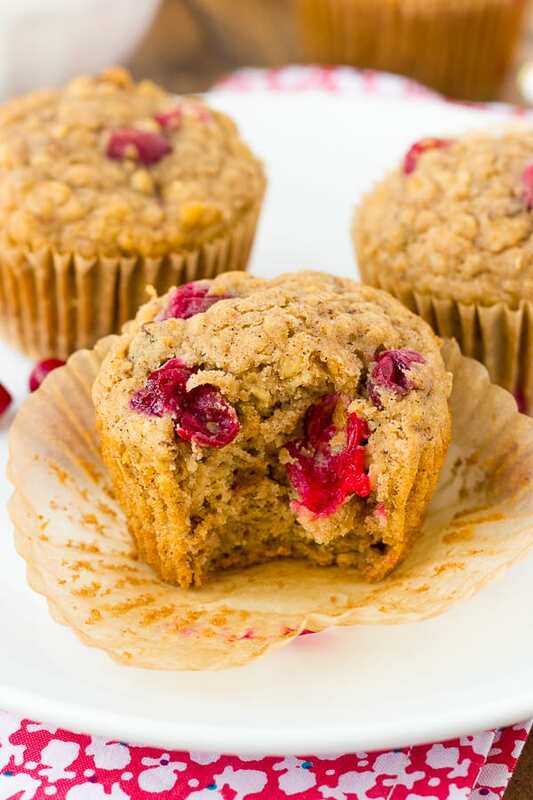 HEALTHY, Gluten-Free Oatmeal Cranberry Muffins! The perfect not-too-sweet December snack. I made these muffins for an afternoon snack for my 3-year-old and I a few days ago and feel in love! 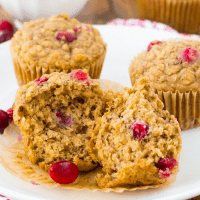 The combination of the tart cranberries, crunchy pecans, and nutty oats is delicious and festive. 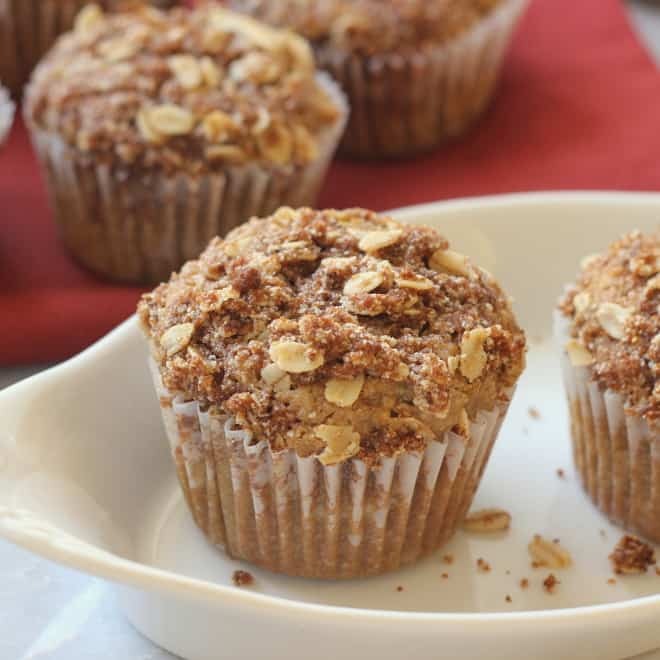 The trick with these muffins is giving the oats a quick soak before adding them to the rest of the batter. I soak the oats in applesauce and almond milk for added flavor and natural sweetness. 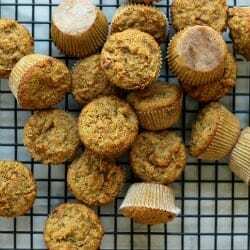 The result is an oatmeal muffin with perfect texture! These muffins are a welcome sight amongst all the other indulgences of the season. They are just a touch sweet, making them great for breakfast. 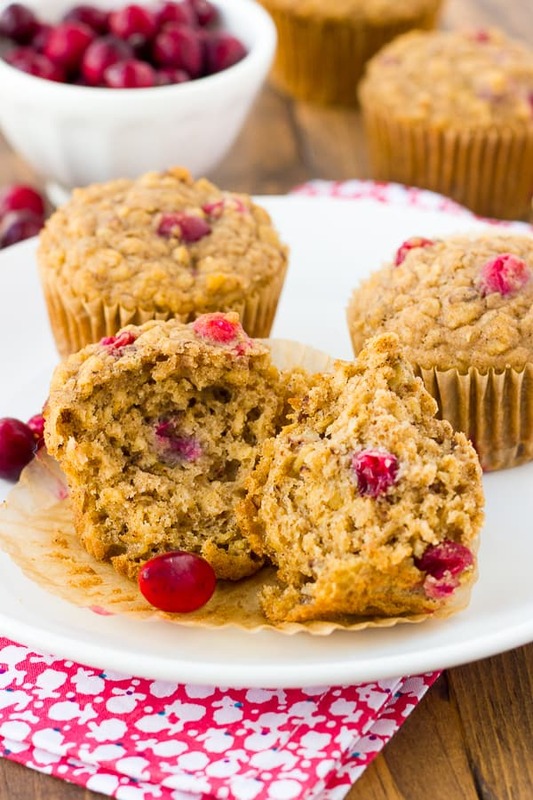 These muffins are also a great way to use up fresh cranberries if you have any leftover. You can also use dried cranberries. I recommend making a double batch because they freeze great! 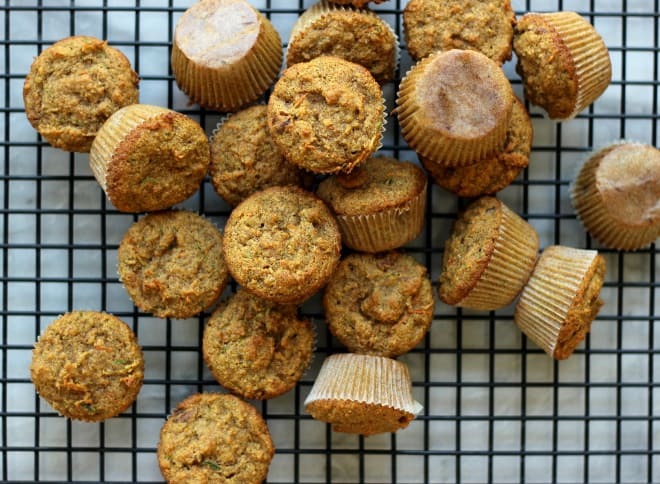 I love having healthy muffins on hand for quick, on-the-go breakfasts. I recommend using a 1-to-1 gluten-free baking flour in the these muffins such as Cup-4-Cup, Bob’s Red Mill, or Better Batter. I used Bob’s Red Mill gluten-free 1-to-1 flour. Any gluten-free flour will work in a pinch. 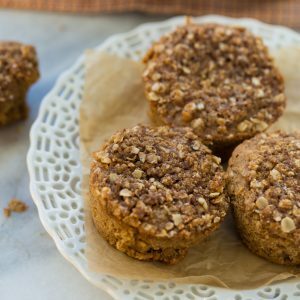 I use organic evaporated cane juice in these muffins, but coconut sugar will work if you want to keep them refined-sugar-free. In a bowl, combine the oats, applesauce, and almond milk. Let sit at room temperature for 20-30 minutes. Meanwhile you can combine the sugar, flour, baking powder, baking soda, salt, and cinnamon in another bowl. Preheat the oven to 375F. Line a muffin baking with liners or grease the muffin cups. Add the eggs, vanilla, and coconut oil/butter to the oat mixture. Stir to evenly combine. Add the dry ingredients along with the pecans and cranberries and stir until totally combined. Scoop into the muffin pan and bake for 17-20 minutes. Let cool in the pan for 5 minutes then transfer to a wire rack to finish cooling. Enjoy! I highly recommend this brand of muffin liners for gluten-free baked goods. If you are using another brand, you may want to spray the liners with cooking spray before filling them. 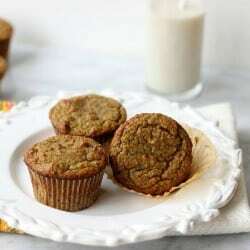 I usually make a double-batch of these muffins because they freeze great! Just defrost individually in the microwave for 30 seconds before serving. 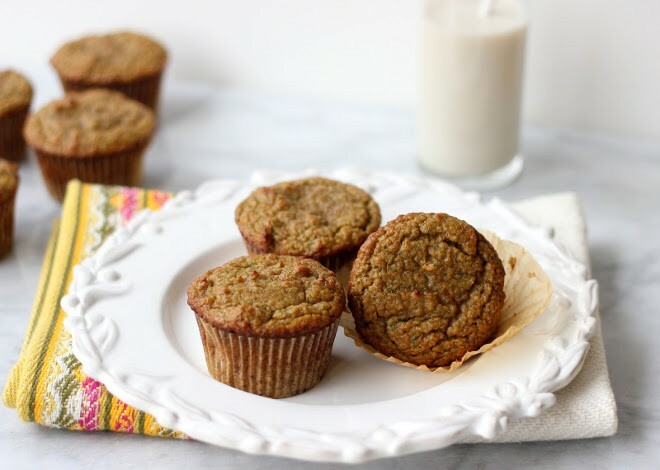 My mornings usually begin with a smoothie and healthy muffin for breakfast so this recipe is perfect for me to try. Thanks for sharing it! Can I try these with almond flour? Did not have applesauce so used canola oil. They are delicious! These are delicious! I halved the sugar and they are still a great hit. Thanks for sharing. How many muffins does it make? How full do you fill the cups? 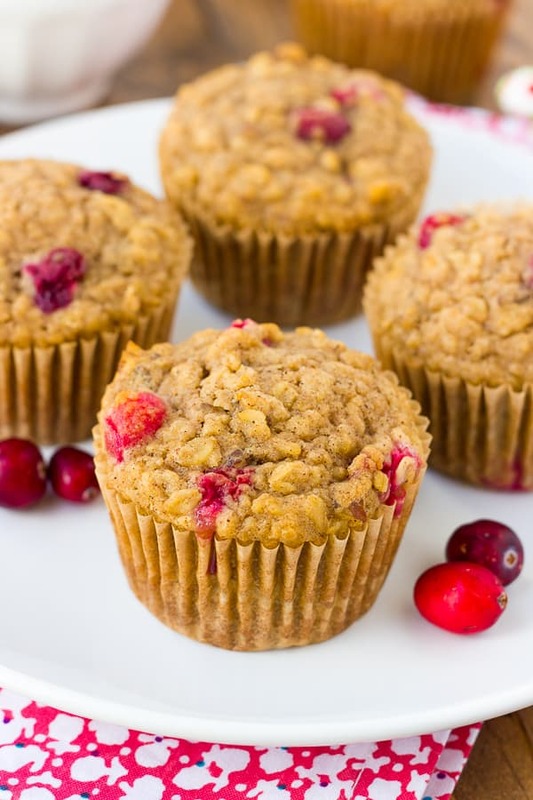 I just bought a big bag of cranberries from Costco and I can’t wait to use them in these muffins! They’re healthy and perfect for taking on the go!